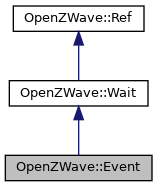 Platform-independent definition of event objects. Destructor. Destroys the event object. Used by the Wait class to test whether the event is set. Set the event to not signalled. Set the event to signalled.